Sometimes we come across a gem in the Store and we appreciate the effort the Dev has put in the App, then we are absolutely blown away when as icing on the cake the Dev makes it free. Such is the case with this NextGraph app in the Store. 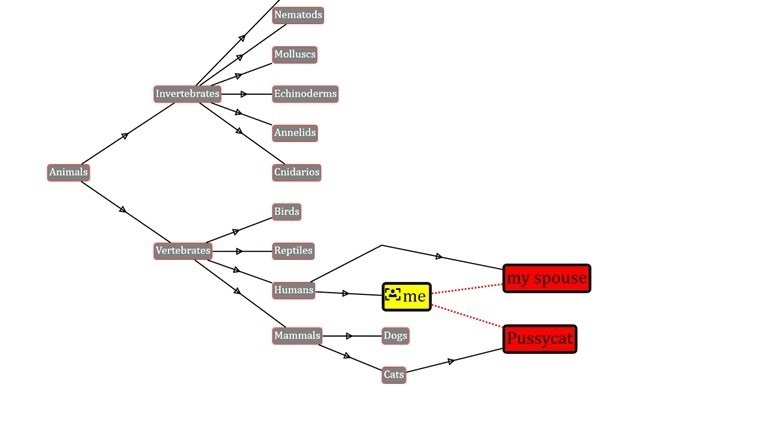 It is a simple yet effective way to dump your mind of ideas and create simple UML relationships. 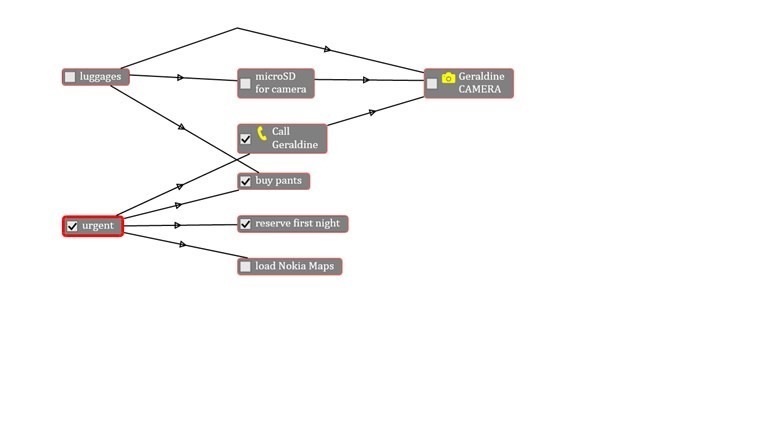 I was looking for a simple tool in the Store to help understand the relationships in an app I’m currently involved with in a project and I came across this app in the Store. Of course it doesn’t come close to NovaMind App that is currently the king of mindmap apps in the Store, but then, NovaMind will set you back $12.00. So, for quick idea notation, you’ve got a winner in NextGraph. 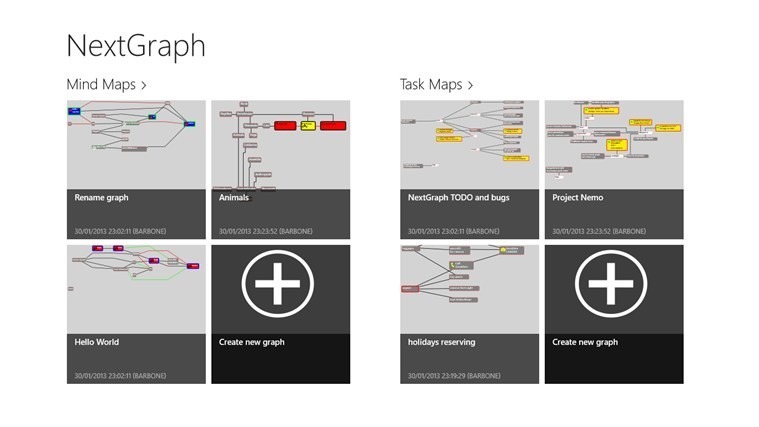 NextGraph is a mind map editor designed for touch screen. To be simple of use, NextGraph lacks by ‘design’ of items arrangement capabilities. Automatic formatting are the normal way to get ‘nice’ and ‘readable’ maps. – hierarchical (horizontal or vertical). Maps with checkboxes are provided as a sort of advanced TODO list. Nodes and links styles (color, font, undirected,… ) are customizable to build your own map vocabulary. Maps could be pinned on the start screen for fast access and edition (tiles of pinned map show a thumbnail of the graph). No need to save maps. They are automatically saved as roaming files (you can access maps from all of your Windows 8 devices). Node names and node associated text could be created/edited with handwriting recognition. 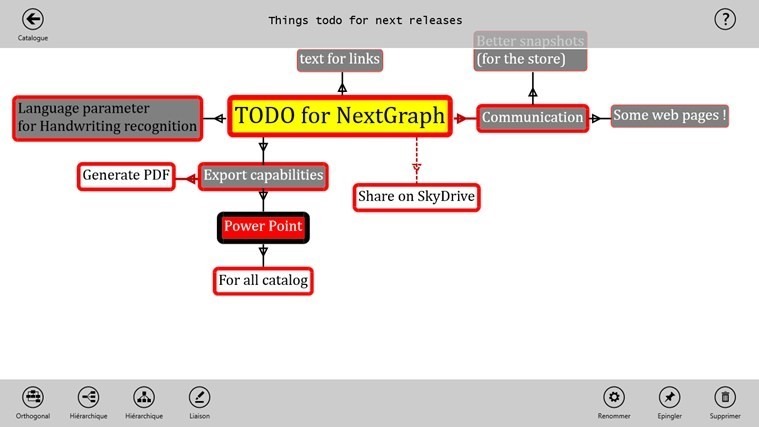 Of course there are other MindMap apps in the Store but none of the Free ones compare to this NextGraph, so go get it and leave a good word behind in the Review page for the Dev. Download now via the source link below.